Gretchen Marlowe and staff members of the JagWire joking around in the halls of Carrboro High School, while trying to capture the essence of the lighter side of an award-winning high school newspaper. 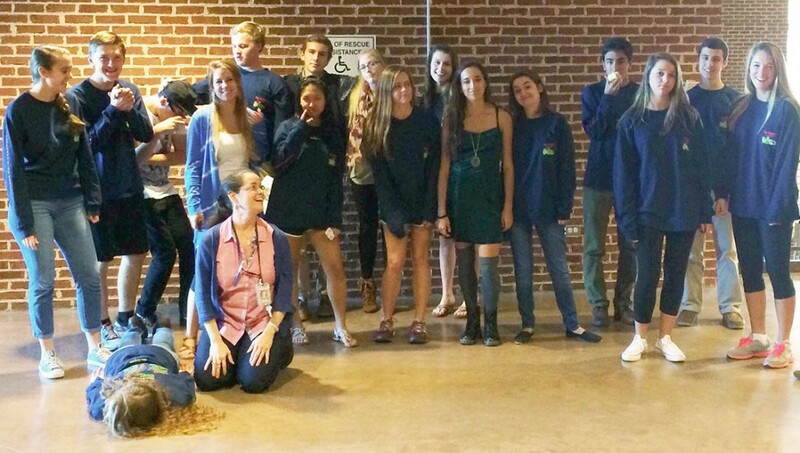 Every day, for the 50 minutes directly following lunch at Carrboro High School, 20 students pile into classroom E216 — home of the school newspaper — on a mission to inform the approximately 850 students who walk the halls on a daily basis. Although the JagWire is a mere seven years old and is its content is authored by 16 and 17-year-old students, the Carrboro High School newspaper has an unusual responsibility in Carrboro, N.C. – enlightening the almost 20,000 people who live within the town’s limits. Carrboro has not had a print newspaper since the Carrboro Citizen stopped publishing in October 2012. For the previous five and a half years, the Carrboro Citizen was a weekly local newspaper that was released every Thursday and was the leading source of information via print for the citizens living in the small town. Now, the JagWire is known as one of the only printed publications in the town and carries with it an obligation that most other high school newspapers do not. Still, due to time restrictions and budgetary limitations, the JagWire is only published approximately every six weeks throughout the school year. When the JagWire is published, it is composed of 12-16 pages broken down into five different sections: arts & entertainment, feature, news, sports and opinion. In 2011, the JagWire was named a publication of distinction by the North Carolina Scholastic Media Association, which reviews high school newspapers across the entire state for a high level of overall content, style and design. Of the seven editors that oversee these five varying sections, six of them are experienced seniors who have been of the staff in past years, including Jocelyn Buckley. Buckley is the editor of the arts & entertainment section and vows her increased responsibility as an editor does not weigh on her at all, and if fact, she cherishes the experiences. Despite increased notoriety due to their standing in the community and previous awards, the JagWire is not without its fair share of areas that need improving, according to Marlowe. For starters, Marlowe, who has been in charge of the JagWire for two years, is always trying to push her students to go more in-depth in their writing, as well as making sure the design and spacing of the paper is perfect once it is ready for publishing. Currently, the JagWire is getting ready to begin brainstorming story ideas for their next issue to be released in late March and accepting applications for students to be part of the staff in the 2015-2016 academic year. With 12 seniors on the staff, Marlowe and the JagWire are planning to see a lot of turnover in the following months. But no matter the new faces that will report to the journalism classroom over the coming years, the JagWire will still hold a local responsibility to the students and the citizens of Carrboro. It is in this accountability that has built a community and a family within the walls of room E216 at Carrboro High that goes beyond schoolwork according to staff writer Cecilia Fang. Kegan is a UNC-CH senior journalism major from Greensboro serving as a writer-photographer for the Carrboro Commons.